Central Elections Committee publishes final results of the 2019 elections. Likud has 36 seats, followed by Blue and White with 35. 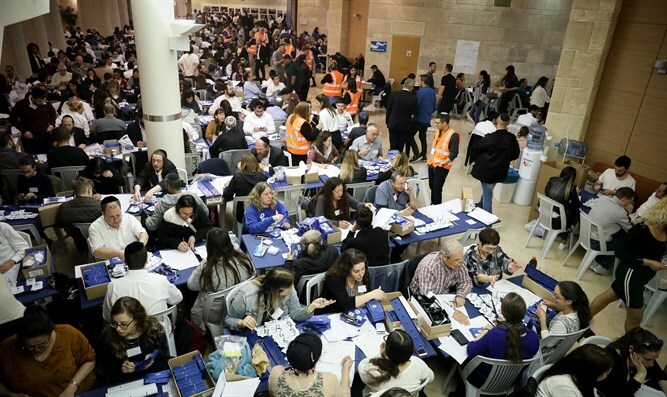 The Central Elections Committee released on Thursday evening the final results of the 2019 elections to the Knesset that were held on Tuesday, after the calculation of the results of the surplus agreements. According to the final results, the Likud is the largest party with 36 seats, followed by Blue and White with 35 seats. According to these results, the right-wing bloc stands at 65 seats while the left-wing bloc has 55 seats. "We reserve the right to examine the results using various additional control tools that the committee operates, in order to reflect the voting in the results, in a manner that is beneficial and in accordance with the Knesset Elections Law, and therefore these results are still subject to changes and adjustments," he added. "We will also address all the extreme irregularities discovered in the counting of the double envelopes. We will accept the voters' decision, but we will not give up until we know what it really is," stated the New Right.